Metastasis is a multistep process that requires the complex interplay of a number of gene products. Many tumour cell properties have been correlated with metastatic capacity, but direct evidence for a role of specific genes in metastasis is scarce. 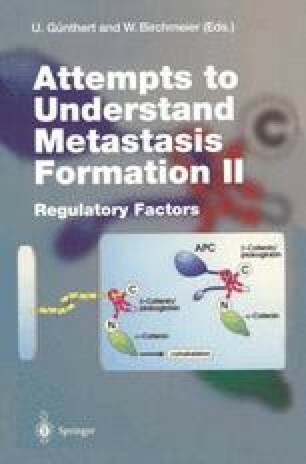 Products of oncogenes, such as Ras, can confer metastatic capacity (see Collard et al. 1988), as can specific splice variants of CD44, of which the expression correlates with metastasis in model systems and certain human tumours (Günthert et al. 1991; Wielenga et al. 1993). In contrast, other gene products such as Nm23, which shows homology to nucleoside diphosphate kinases, can supress metastasis (Leone et al. 1991), and downmodulation of Nm23 in mammary carcinomas has been associated with poor prognosis (Bevilacqua et al. 1989). Proteins involved in invasion also influence metastasis, as has been shown for proteases and their inhibitors (Liotta et al. 1991) and for adhesion molecules that play a role in cell-cell and cell-matrix interactions, e.g. E-cadherin (Behrens et al. 1990; Vleminckx et al. 1991) and certain integrins (Roosein et al. 1989; Chan et al. 1991). In order to identify genes specifically involved in the acquisition of the invasive and metastatic phenotype of tumorigenic cells, we have used proviral tagging in combination with in vitro selection for invasive T lymphoma cells. These studies have led to the identification of the Tiam 1 gene, which encodes a protein that regulates the activation of Racmediated signalling pathways.